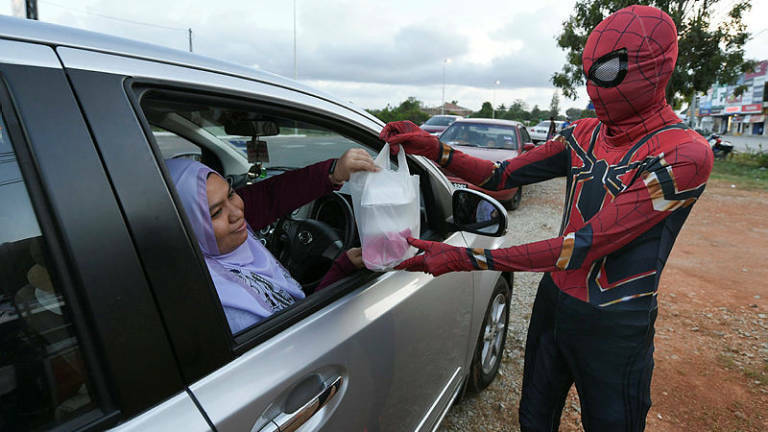 05 Feb 2019 / 20:09 H.
WHAT was at first embarrassing has turned out to be a blessing in disguise for 18-year-old Fakhrul Fahmie Ishak, who dons a Spiderman costume while helping out at the burger stall run by his 22-year-old brother Ahmad Ridhuan Ishak. 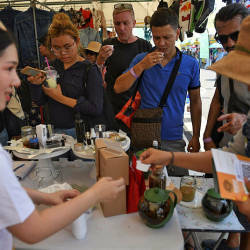 Sales have picked up since they first opened the stall with their friend Muhammad Syukri Hakim Yacoob, 21, at Kampung Raja-Kota Putera on Dec 31 last year, with a never-ending stream of customers thronging the stall. According to Fakhrul Fahmie, the youngest of eight siblings, he was just helping his brother out while waiting for his Sijil Pelajaran Malaysia (SPM) examination results so that he would have some savings to pursue further education. “At first, I was embarrassed to wear the Spiderman costume because everyone passing by could see me. Yet, the feeling turned to excitement when our business began to boom. “They would come here to try our burgers and take selfies with me,” he said when met by Bernama at the stall. Fakhrul Fahmie said that sometimes vehicles passing by would turn back when they see him standing by the road side and waving to them. 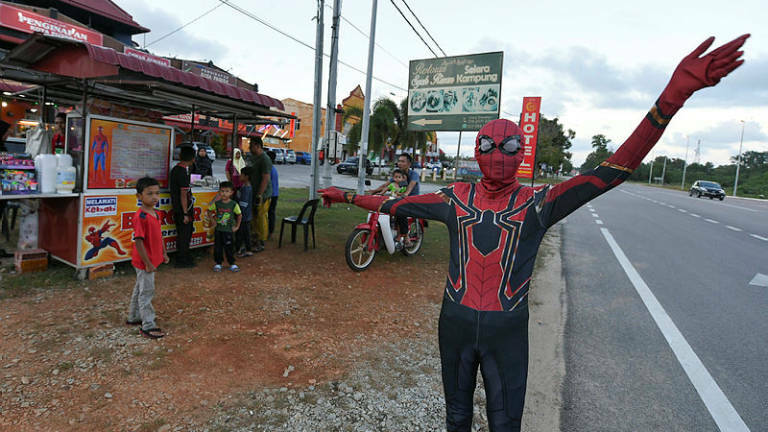 “They would stop for a while for their children to take selfies with me and that’s when I would take the opportunity to promote our ‘Spiderman Square Burger’,” he said. Meanwhile, Ahmad Ridhuan said the idea for the costume was a spontaneous one, and they bought it online for RM100 in early December. 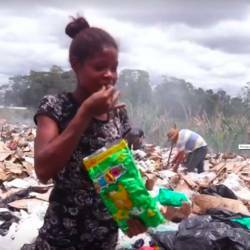 “Everyone knows that you can find burger stalls everywhere, so that’s why we had to find a creative business strategy to ensure our burgers are different from those sold elsewhere. 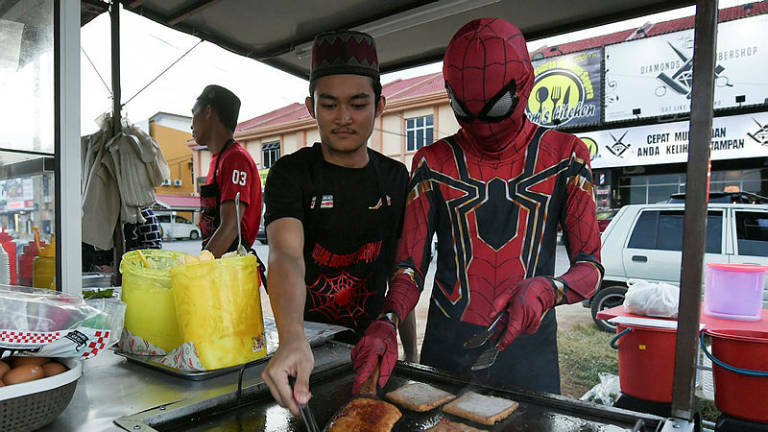 “Since it would be difficult for Syukri or me to grill the burgers while wearing the costume, we asked Fakhrul to don it and attract customers to our stall. 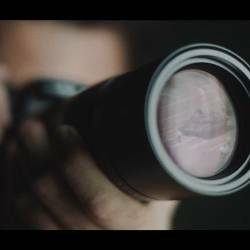 Fakhrul gladly agreed to it,” he said. Apart from the Spiderman costume, they also made sure their burgers were different from others by using a combination of colourful bread and square-sized patty. The result has been astonishing as they can sell more than 100 burgers a day, with prices ranging from as low as RM2.50 to as high as RM10.50, and they are also able to make almost RM400 per day compared to earning RM50 to RM70 a night when they worked at a burger stall in Pasir Puteh (Kelantan). Meanwhile, Muhammad Syukri said they were happy with their business despite it being a small stall as they could work at their own time and even go back home early when they run out of stock. “We begin as early as at 5pm, after the Asar prayer, and close shop at 1am. Previously, when we were working for someone else, we would start at 4pm and only go home at about 4am or 5am.